I point out the surprising similarities between today&apos;s intolerant religious extremists and the extinct fish of ancient seas. What should be the approach of the tolerant, with regard to the intolerant? This is a serious question, because at its heart is the question of whether war is ever justified. The religious extremists who have appropriated the previously-respectable label of "conservative" insist that they are at war with the "Godless" remainder of humanity. It isn't unusual to hear their spokesperson, Ann Coulter, say that homosexuals or liberals or even Supreme Court judges should be killed. While she has not yet been convicted of one of these murders herself, one doesn't have to look far to see the results of such hate speech: Matthew Shepherd's murder was the tip of the iceberg; the FBI estimates that 15% of all murders are hate crimes committed against homosexuals, making gays the third-most-frequent victims of such crimes. Many more gay people are merely beaten; and many of those crimes go unreported because often the local police are disinterested in pursuing the perpetrators. 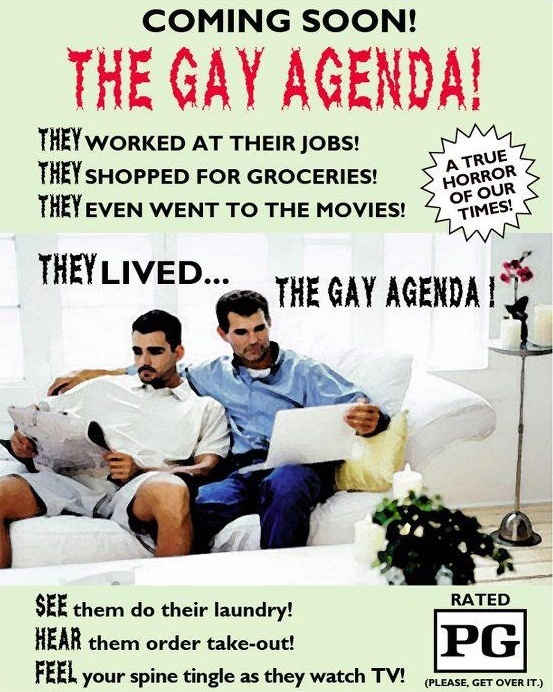 Gays, on the other hand, have no actual interest in "converting" religious extremists or anyone else. There's no need; there's plenty of gay people around and most of us enjoy living in diverse communities that include heterosexual families. In fact, we don't even mind the presence of a view religious extremists, as long as they leave us alone. Unfortunately, they usually don't. So there you have it: The religious extremists are intolerant; the gays are tolerant—but that doesn't stop the attacks on gays by the religious extremists. Gays could become intolerant of religious extremists in self-defense. (In fact, many individuals have done so.) But it wouldn't really make a difference, because the religious extremists believe gays are intolerant whether they are or not. In a one-sided war, people can still be killed. Besides, many tolerant people feel that, if we become intolerant, there will be no difference between us and those who would see us destroyed. And then—what's the point? The Iraq war is another example. Americans were convinced by the Bush administration that the people of Iraq posed a threat to the people of the United States. We were told they possessed "weapons of mass destruction" and imminent nuclear capability. These were all lies, but it didn't matter; we attacked Iraq anyway, turning friends into enemies, and killing thousands of our own people in the process, as well as hundreds of thousands of Iraqis—and multiplying the danger of attack by terrorists seven-fold. The intolerant—us—attacked the tolerant, and both sides have suffered as a result, and continue to do so. Wars are easy to foment, as long as you have the ear of the people. It seems there are generally enough folks whose fears are fertile ground for lies, to be convinced that some other people are out to get them so that they fight back. Both sides lose; it's the invisible third side—the bankers and weapons makers—who inevitably win. Funny; they're the very ones who put the leaders into office, so they can convince us to march off to the next war. They couldn't do this, however, if there wasn't a ready supply of fearful people eager to embrace these lies. Aggression is the armor fearful people use to protect themselves against all the bogeymen they believe are out there. Muslims…gays…tolerant folks. All threaten the status quo of the fearful. We all know from childhood, that the schoolyard bully is actually the most fearful of all. He simply uses aggression to keep his fears at bay. 450,000,000 years ago, in the Ordovician period of the Paleozoic era, there was as yet no life—not even plant life—on land. But the seas of Earth were teeming; and the creatures that lived there were heavily armored. This was not an age of soft little sissy fish, such as exist today. Even today's most fearsome shark would be quickly scooped up by the frightful Cameroceras, a cross between a giant squid and a Sherman tank. At 30 feet in length, what made it most terrifying was that it was nearly impregnable. A modern shark, even a Great White, would be unable to penetrate its thick armor before being itself crushed by Cameroceras' horny beak. 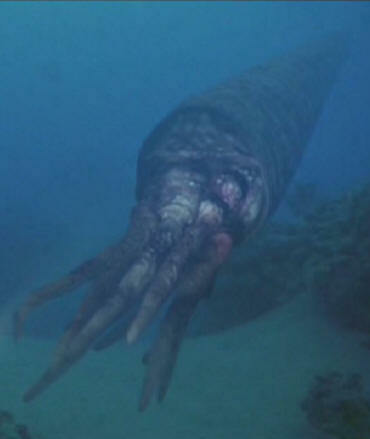 Perhaps as a result—or cause—the other creatures in the Ordovician seas were also heavily armored. While still no match for Cameroceras, the top predator, such armor may have provided protection from lesser predators of the day, such as Megalograptus (giant sea scorpions). Jumping ahead a hundred million years brings us to the Devonian period of the Paleozoic era. In this age, too, most of the sea life was heavily armored. 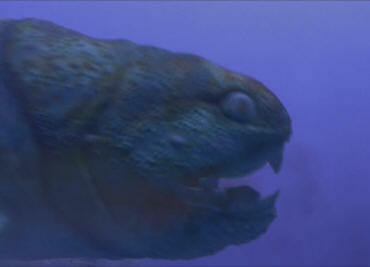 including the top predator, Dunkleosteus, and the various creatures on which it fed. One would be justified in assuming that these invulnerable leviathans would have been wildly successful, in an evolutionary sense. After all, they couldn't be harmed by anything and they could eat any other living thing in their world. And yet, for some reason it didn't actually work out that way. Dunkleosterus left no descendents, not one. His was a dead-end branch on the tree of life. By the time the Paleozoic era ended 251,000,000 years ago, the heavy armor of Megalograptus and its kin had thinned to the exoskeletons of today's insects. Crunchy, to be sure; but no longer the impregnable armor of a living tank. Why? Well, the way evolution seems to work, is to strike a balance between self-preservation and energy use. Armor takes energy—a lot of energy—to grow. And, once an animal is saddled with thick armor, even more energy is needed for it to move about, to hunt for more energy. All this energy, of course, comes in the form of food. And the trial-and-error process of evolution soon discovered that working smarter was more efficient than working harder. The energy that had once been devoted to growing ever-thicker armor, was instead turned to more subtle senses and bigger brains. Even the goldfish in a bowl in your kitchen is a thousand times smarter than an Ordovician Cameroceras (not to mention, a lot cuter). So, as one moves forward in time, one sees that the oceanic predators of each age, while still being fearsome, spend less energy on protection than on swift movement and agility. Likewise, the prey also forsake armor and fearsome size for the ability to camouflage, evade, and out-procreate their predators. Even the Megalodon shark of 16 million years ago, the largest sea predator that ever lived (up to 52 feet long), was soft and squishy compared to the armored giants that preceded it. And that formidable size must also have not been an evolutionary advantage, since today's Great White shark (a modern relative of Megalodon's) is less than half Megalodon's size—and is today the largest predatory fish. As it turns out, boys, size isn't everything. Yes, evolution shows us that armor and size are dead ends; the future lies with the intelligent and the quick. That's why I do not despair over the presence of the religious extremists and other fearful fellows among us. Oh, I am wary. After all, these folks do want me dead. But if I spend my energy on responding to their fear, they will have won. I can only "win" by keeping the faith, by remembering that, in the long run, their approach to life is one that has failed, repeatedly, through the eons. It's clear to me that, like the Cameroceras, Dunkleosterus, and other armored and terrifying creatures of Earth's past, the religious extremists will, someday—hopefully soon!—become extinct, done in by the weight of their own fears, which lure them into making political decisions that are to their own detriment, and causes them to create enemies faster than they can be defeated. And if you have any doubt as to the lack of intelligence of the religious extremists…well, check out Conservapedia, a web-based "encyclopedia" created to counter the reality found in Wikipedia. (As Stephen Colbert of The Colbert Report points out, "Reality has a well-known liberal bias.") You won't find any entries for Cameroceras, Dunkleosterus, or the other species I've mentioned there; because Conservapedia pretends there's no such thing as evolution and refuses to acknowledge the errors of the past. Instead, you'll find hate-filled, biased references to homosexuality, Muslims, and any other issue for which the religious extremists need reinforcement of their lies. History has shown that intelligence is the key to long-term success. Hiding from reality beneath a cover of self-serving lies is not a sign of intelligence. So, we can relax. There will never be a "final battle" between the intolerant and the tolerant, because the real battle the intolerant are fighting is an energy-inefficient war against reality. And this is a battle they cannot help but lose. You don't have to believe in evolution, to be an evolutionary dead-end.